Pittsburgh Seminary continues our sermon writing tips series. Be sure to look for other tips from faculty, staff, and alums in the months ahead and read our recent posts on preaching without notes, dealing with writer’s block, 12 questions for effective preaching, using art as a tutorial to Scripture, preaching about current events, and preaching from the Old Testament. Have a tip you’d like to offer or have a sermon issue you’d like help with? Let us know by using the comments option. Over the past few weeks, we heard preaching compared to the Ghostbusters, and even a mention of audience participation involving rocks. I love outlandish ways to think about sermons, so with comparisons like that I couldn’t resist chiming in. Having served a local congregation, and now a national institution, I have preached regularly in two very different roles, so I’m going to offer some outlandish comparisons of my own drawn from each. After I finished my MDiv at Pittsburgh Theological Seminary, I served Grace Covenant Presbyterian Church in Orlando. Next time you visit Disney, it’s a tremendous congregation and only about 30 minutes from the parks, so stop by and say hello for me. Serving there for five years led me to a number of insights about preaching in a local church. Here are a few highlights. 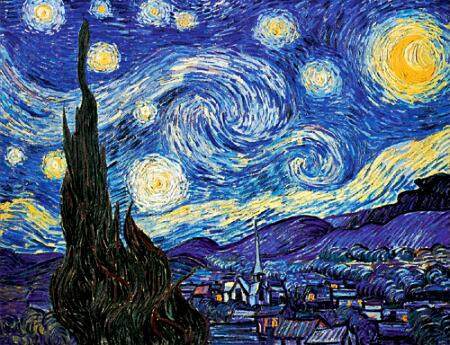 You know those famous paintings made up of all those little dots? They’re usually painted by Van Gogh or that other famous guy you can’t remember right now. (His name is Seurat.) When you look at those kinds of paintings up close, they’re great. But when you step back, you find an amazing picture that wasn’t there until you saw it all together. Preaching is like that. The cumulative effect of years of preaching is far more significant than one individual sermon, and sometimes you can’t even tell what the impact is until you see it all together. I had a lot of fun with an annual “series” that took place each year around Christmas. That kind of long-term impact is far more substantial than most of us realize. Pay attention to the sermon you preach not just each week, but over the course of the year. I love cookies. Who doesn’t? But, if you eat cookies all the time, you would eventually get tired of them. Or so I’m told. Preaching is like cookies. To be more precise, your preaching style is like cookies. As great as it is, people may come to love it even more if sometimes they have something else instead. Like cake. In Florida, I had the privilege of working with a pastor named Bob Eckard. As the senior pastor, he was very generous with sharing the pulpit, so I preached way more than most associates. As a result, the congregation heard each of us preach a lot, and got to experience two different styles on a regular basis. They came to appreciate the differences in our styles, and found them to be complementary. Regularly hearing a good preacher also helped my preaching grow and evolve. This is an advantage that larger churches naturally have that can be healthy for solo pastors to seek out. Doing so will help you with preaching consistently good messages. Give the cookies a rest and have some cake. Ask someone else to preach sometimes – even when you’re in town. Need ideas? Try a missionary you support, an elder or deacon, a Sunday School teacher, youth director, or even (ahem) Seminary faculty or administrators. When you go swimming, the best way to find out what the water’s like is to jump in. Preaching is the same. Being immersed in the life of a congregation is the best way to learn what concepts, words, or images will really make a splash. Homileticians and preachers often talk about exegeting a congregation. There’s no way to do that without diving into the life of a parish. Spend some time paying attention to the “water” you swim in. On an unrelated note, next time I’ll share some contrasting insights from my role as a travelling preacher. In the meantime, look at some pointillism, eat a cookie, and then (after 30 minutes) go for a swim. Pittsburgh Seminary continues our sermon writing tips series. Be sure to look for other tips from faculty, staff, and alums in the months ahead and read our recent posts on preaching without notes, dealing with writer’s block, 12 questions for effective preaching, using art as a tutorial to Scripture, and preaching about current events. Have a tip you’d like to offer or have a sermon issue you’d like help with? Let us know by using the comments option. Actually, except for the “dogs and cats” part, this is a pretty fair summary of the impression many people, even life-long believers, have of the Old Testament. No wonder we are reluctant to read and study, let alone preach from, the first two-thirds of Christian Scripture! I am going to list the top three reasons I have heard for not preaching from the left-hand side of the Bible. I am then going to argue that each one is actually a reason that we need to preaching from the Old Testament. 1. The Old Testament God is wrathful and violent. and the Lord will by no means clear the guilty (Nahum 1:3 NRSV). Rather than providing simple, condescending answers to our questions, the Old Testament invites us to join in the age-old struggle for meaning, and so to find ourselves in conversation with the Divine. 2. The Old Testament is law, the New Testament is grace. to do justice, embrace faithful love, and walk humbly with your God (Micah 6:6-8). 3. The Old Testament is odd. Guilty as charged! The Old Testament is, after all, old: it reflects the worldview of ancient cultures, far removed from us in time and space. The oddity of texts such as Ezekiel’s vision of the LORD’s glory (Ezekiel 1) should not, indeed cannot, be denied or explained away. However, precisely because they are strange, these passages may be able to help us hear anew a message that more familiar texts no longer effectively convey. The message of God’s caring, and God’s determination to come to us where we are, may no longer sound so strongly in passages we have heard over and over again (such as John 3:16). But the wheels beneath the divine throne in Ezekiel’s vision reveal that God is enthroned in a chariot, enabling God to be present in God’s full glory wherever God wishes–a striking image that, in its very strangeness and unfamiliarity, may break through to us as it did for African slaves discovering the Bible and its faith. Preaching the Old Testament is not optional: if we believe that the Bible is indeed word of God for the people of God, then we need to preach Scripture in its fullness. When we do so, we will experience the power of God’s word and God’s presence anew. This post first appeared on The Bible Guy blog written by the Rev. Dr. Steve Tuell who serves as the James A. Kelso Professor of Hebrew and Old Testament at Pittsburgh Theological Seminary. Other recent posts have looked at how to read the Bible, grace, peace, and violence in the Bible. Pittsburgh Seminary continues our sermon writing tips series. Be sure to look for other tips from faculty, staff, and alums in the months ahead and read our recent posts on preaching without notes, dealing with writer’s block, and 12 questions for effective preaching. Have a tip you’d like to offer or have a sermon issue you’d like help with? Let us know by using the comments option. Words are a preacher’s joy, delight, and challenge. But at best, words are just one of the many tools of the blessed Holy Spirit. As a lover of words I give my best to each word, but I realize the real sermon is the one going on in the hearer’s heart and mind, touched by the Spirit of God, not necessarily my words. So whenever possible, I enjoy offering two sermons—the words so carefully prepared as my prompt and a visual with an artist’s interpretation. The journey from commentary, blog, and library as guide to scripture to listening to artists, liturgical and otherwise, was not an easy one in my case, but the Holy Spirit is relentless. My conversion to listening to art and the artist began with the story of Joseph and Mary. With simple pen drawings of a reluctant Joseph traveling with a pregnant Mary on a lonely road, and a framed window where Mary might have looked out to the glowing night sky, which anticipated the magnificent Glory to God in the Highest, to the transformed Joseph holding his Christ Child, I watched fabric artists bring scripture to life. It helped that I had been part of the audience in a fabulous production of The Black Nativity, a dramatic musical set to Scripture’s deepest beats. My tutorial in hearing Scripture through art has continued for years. By engaging with art a sermon is given the opportunity to explore multicultural images. We think and visualize in images that mirror our own reality. Imagine, “A man walks into a room . . .” what does he look like, what does the room look like, is this sinister (and why? ), is this a threat (and why? ), is this comforting? Where are the lights and shadows in your imagination? An artist provides these interpretations by which our assumptions may be challenged. My favorite image of Abraham used during a sermon from Genesis, is a poster advertising for a film about Abraham, the name of the film escapes me. The poster had Abraham’s face, lined, aged, seasoned, hardened, and softened with experience—a man of great sorrow and equal joy. His head was draped in the fabrics of his time and place. The face was that of the Disney actor Dean Jones, a face I remembered well from my childhood. Dean Jones played fun characters, good stalwart characters, enjoyable TV movies for a Sunday evening. What crossed my mind as I saw him portraying Abraham was, how could Dean Jones ever commit to killing Isaac?? The picture gave voice to “how could Abraham have done that?” Art has the blessed ability to challenge our basic assumptions. My reluctant journey into art’s interpretation of Scripture brought me into contact with dozens of liturgical artists. No image may be printed or projected without the artist’s permission—which gave me the opportunity to meet several artists. Most are thrilled to hear how their art helps you interpret God’s word. Most liturgical artists merely ask that credit be given where due. Friendships developed and I am the richer for it. As an example, in Jesus’ crucifixion she paints just the end of one cross beam, with Jesus’ lifeless hand. Reaching toward Jesus’ hand, really his finger, is the very finger of God in the same style of Michelangelo’s famous painting of God touching Adam at Creation with new life, but this new creation is reviving the new Adam, Jesus the Christ. Gwen writes that in the cross beam of Jesus’ cross she sees a bridge between God and humanity. To this Gwen adds, of all things, a curious little sparrow. The viewer sees the sparrow long before recognizing the cross of Jesus. It draws down our defenses; it gives us, the preacher and congregation, a point of contact because the finger of God also seems to be reaching for the sparrow to cross the gap into life. 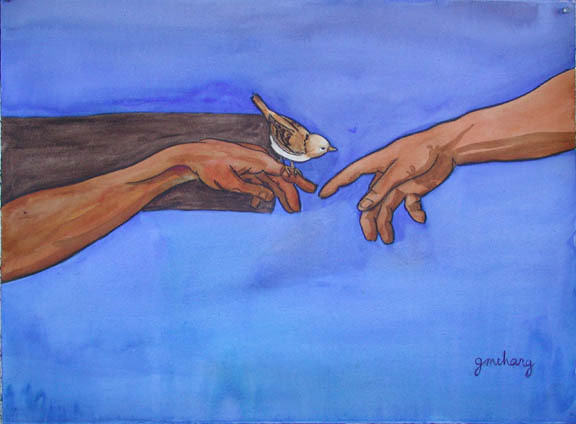 The sparrow is not intimidated by God, but free and accepting. Gwen writes, “(I) represent Jesus’ sacrifice on the cross as being our bridge to God. Of course, the sparrow is us. 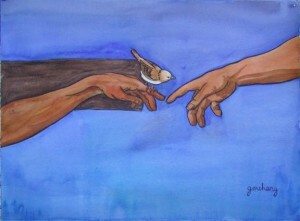 The little sparrow is resting on Jesus—oblivious to His condition—and about to hop over to stand on God’s hand. Seeing His Son suffering, God still reaches out for the sparrow.” The Exchange has helped me see and live the life-giving cross, provided by the God of the sparrow, God of the whale; God of the swirling stars, (and with all creation we sing) how does the creature say awe? How does the creature say praise? ** Amen. Jane Esterline is new to the PTS community this summer. She is a minister with a heart for the congregation who served a mid-sized church in rural Illinois before moving to Pittsburgh to join President David Esterline. Together they served as mission co-workers in Cameroon and Fiji Islands. Her focus was on building bridges through solidarity.